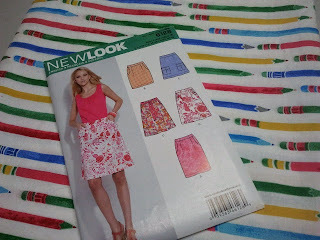 This month's garment of choice for my merry MAGAM make was this nifty fabric, made into -- what else -- a pencil skirt! 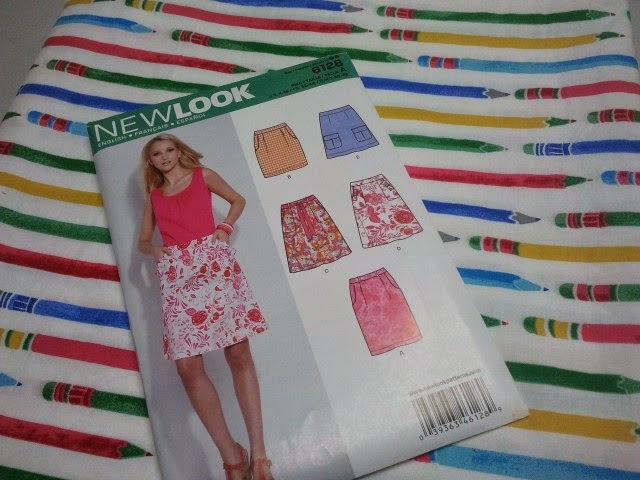 After much deliberation among my many skirt patterns, I used New Look 6128; I liked that it had great pockets and belt loops too, on View A, my choice. (the bottom pink one). I am really pleased at how it turned out. I learned a lot from this project: I'd never made or added belt loops before; the pocket, though a basic design, was new to me; and because it was a quilting cotton that was fairly see-throughish, I also lined it with white cotton broadcloth. Thankfully I've done a few lapped zippers by now so that wasn't new or difficult -- as a matter of fact I just bought a proper zipper foot so it was actually much easier than previously! I found this a straightforward pattern -- I made a few changes but not really very big ones. I found the sizing pretty good; I cut a test waistband from the broadcloth before starting the 'real' project, and found that I needed to take 1/2 inch in, from the size 16. I kind of wish I'd taken another 1/2 inch but it does fit very comfortably and of course, there are those nice belt loops for a snugger belted look. I cut 16 across the hips, and tapered in for the last 6 inches or so to end up with the hem 1/2 narrower on each side (1/2 on each seam allowance, so both sides had a total of 1 inch narrowed). So really, it's probably a 14 at waist and hem and 16 across the hip area. I changed the front pleats too -- the way they are drafted, it created a boxy fold right across the middle -- not where I want to add bulk! I think it was mostly because of the fabric choice, as it stood out in folds quite sharply. So I turned them into inverted pleats and pressed out the remaining bulgy effect. It works quite well, I think. I also lined it, stitching the lining into the waistband seam but leaving it loose around the zip so I could hand stitch it down and give a nice neat look to the finish. I also pressed up the lining with the hem and then hand stitched the hem so that there was no stitching line on the outside. Because of the crispness of the cotton, it took pressing very well, and held its shape nicely while I handstitched, so the hem turned out nicely even -- skirt and lining both laying together smoothly. I really love it -- it's fun and colourful and very comfortable, and not nearly as wrinkle-prone as I had feared! 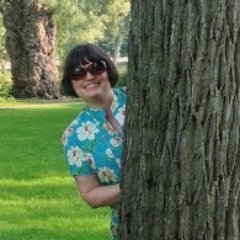 And because of all the cheery colours in it I can wear it with numerous tops that I already have -- some RTW and some that I've made myself. Here are a few examples! 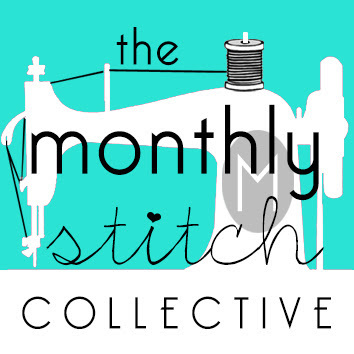 This was a super fun project, and I know I'm going to get lots of wear out of it this summer. Very pretty and very useful. 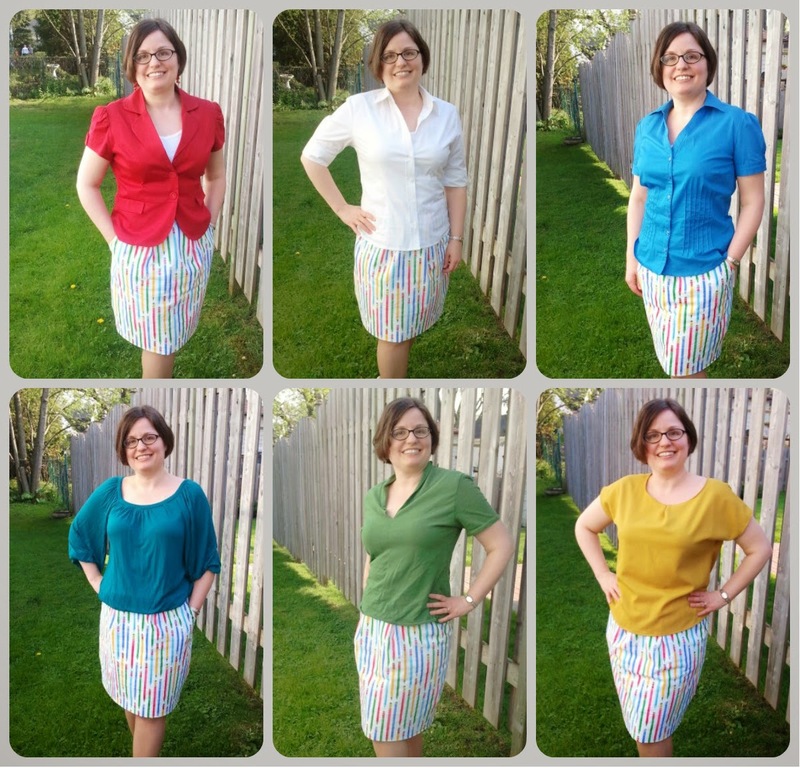 I love skirts that can be worn with several different tops. So useful! Will be wearing this one a lot, I know. 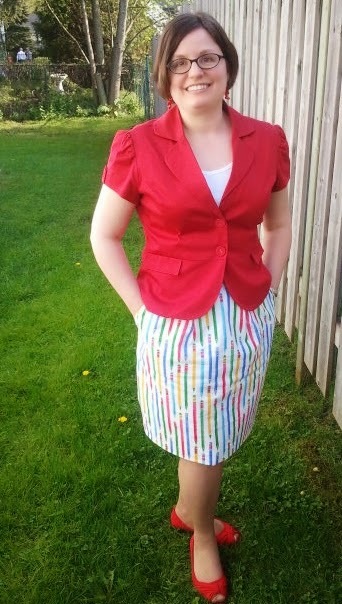 What a fun springtime skirt. It's just delightful. Very bright and spring-like -- it makes me happy to wear it! Yes, I think it will be in constant rotation this summer!